Foodies with an eco-conscious palate have an evolving choice of cafés and food outlets throughout New Zealand where vegan goodness is the by-word to delicious flavours and wholesome sustenance. There are many popular cafés and restaurants in the main visitor centres that offer some vegan options for those with a preference for natural, and those offerings can be very … very good. New Zealand’s cult vegan destination is surely ‘the unbakery’ - Little Bird Organics in Auckland. At three cafés around central Auckland, where everything is made from scratch, the salad bowls are legendary, and so is the ‘cheesecake’. Little Bird’s ‘unbakeries’ are found in Ponsonby, Kingsland and Britomart. Revive is an Auckland institution that has been keeping vegetarians and vegans happy in Auckland since 2005. The menu changes weekly with an extensive range of salads along with daily meal, hotpots and dhal specials. The café has also released a series of successful cookbooks so customers can recreate their favourite dishes at home. Misters Real Food has a strict food philosophy using only wholefoods, free from gluten, dairy and refined sugar. 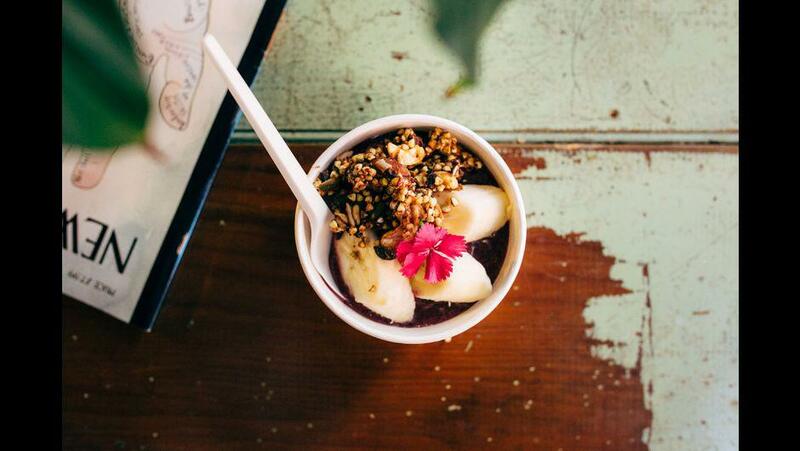 While not exclusively vegan, their vegan options are hard to match and their infamous lunch bowls are extremely popular with the locals. Using only the best organic, local and seasonal produce, the results are in the taste and nutrition. Hectors Restaurant in the heart of Auckland’s Heritage Hotel pays particular attention to the needs of vegetarians and vegans. Newly launched menus in the restaurant and lobby bar are entirely plant-based. A whole section of the kitchen is animal-product free, right through to the coffee machine using only soy and rice milks. Executive chef Jinu Abraham, who specialises in plant-based cooking, trained in India. Even in Auckland - New Zealand’s largest city – you’re never far from a farmer’s market. On Saturday mornings local producers and farmers set up in Britomart Square, in downtown Auckland, where city slickers can buy fresh organic produce for the week. Oratia Farmer’s Market, a short 20-minute drive west from Auckland, is set on a vineyard. Each Saturday morning locals and visitors stock up on fresh bread, fruit and veg. In a beautiful rural setting, Clevedon Farmer’s Market (a 40-minute drive south of Auckland) is one of the region’s premier markets. Be tempted by the seasonal offerings of fruit and vegetables picked as recently as the night before if not early on market morning. Maranui, right on the beach above the surf club in picturesque Lyall Bay and just 10 minutes from Wellington city, is a Wellington institution. So much so that when the building was severely damaged by fire, the hospitality industry got together to help them raise the funds to open up again. The vegan fare is delicious and they proudly proclaim themselves as the ‘best coffee in the bay’. Wellington’s infamous Cuba St is a colourful strip in the heart of the city. Midnight Espresso, found at number 178, is laid back and relaxing, they also offer a range of predominately vegetarian and vegan counter and menu food. Vegan donuts here are extremely popular and often sell out. Deluxe is another Wellington hotspot where you will find locals sipping long blacks and munching back wholesome food in uber-cool surroundings. Keep an eye out for their famous vegan sandwiches. They’re just along the street from the Embassy Theatre (think Lord of the Rings and The Hobbit premières), at the end of Courtenay Place. Greytown, in the Wairarapa region and just an hour’s drive north of Wellington, is home to Food Forest Organics. This small-town grocery store stocks a variety of specialised organic products and produce. James and Suzy Cameron’s nearby ‘Cameron Family Farms’ is the primary producer supplying the own-brand in store honey, olive oil and hemp seed oil that is processed in-house in small batches. The Lotus Heart, in Christchurch, is dedicated to conscious living and healthy eating. Lotus Heart is a pure vegetarian restaurant that also offers options for vegan, gluten-free and raw food diets. There is a health store on site and vegans looking for a coffee should try it with the homemade cashew milk. Queenstown’s Aro Hā Wellness Retreat provides a rainbow of stylish vegetarian and vegan cuisine. Paleo-friendly, gluten-free, dairy-free, and enzymatically active, the award winning retreat aims to treat the body a diet rich in trace minerals, vitamins, and phytonutrients. Before or after a healthy vegan meal, yoga, meditation and other relaxing activities are on offer. Bespoke Kitchen holds the title of the 2016 New Zealand Café of the Year and it just so happens that healthy eating is the mantra at this award winning establishment. Most of the food is either raw, vegan or gluten free with menu highlights such as the miso and rosemary buckwheat raw pizza with tangy tomato sauce, rocket, olive and vegetable salad with cashew cheese.